Penguin wire braider are one of the best in the industry, meeting the current industry standards of high quality and speed for catering to the upstream and downstream machines. The braid quality and the pitch speak for the quality on its own. The conventional braiding of 2 over 2 is widely used for braiding high pressure hoses. 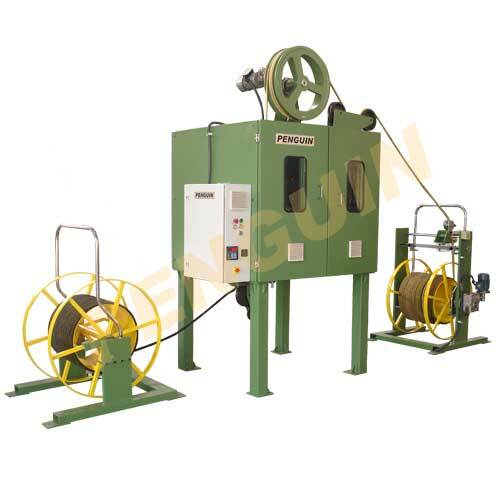 The structure causes the strands of wire to be flexed more aggressively and hence during the pressurisation process, the abrasion between the layer of wires is more intense. In 3 over 3 braiding, the flexing of the wire strands perpendicular to the direction of lay is minimum. This ensures higher strength against the bursting forces. Also, the longitudinal changes in length of the hose is also minimised. Thus 3 over 3 braiding puts lesser kink on the wire compared to 2 over 2 braiding. The “Penguin 3 over 3 Braider” adopts this latest technology in braiding and ensures 50% higher productivity for the same horn gear speeds.